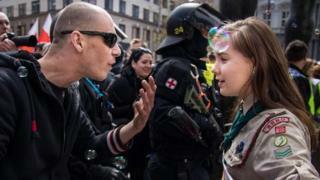 A 16-year-old girl Scout pictured standing up to a far-right skinhead has told the BBC she was not afraid of neo-Nazis and wanted more young people to stand up to fascism. Lucie Myslikova, a film and animation student from the Czech city of Brno, was captured in her uniform confronting a shaven-headed demonstrator. The rally was held on May Day by the neo-Nazi Workers Party of Social Justice. The photo has since gone viral. "I wasn't afraid," Lucie told the BBC by telephone from her school. "I went to the counter-demonstration as someone who was determined to change things. To me it makes sense to try and change the world around me," she went on. "I think young people should get involved in such things. They should be aware of what's going on. "You ask me if standing up to skinheads should be left to older people - well us, younger people, are going to be living here a lot longer than the older generation." Lucie explained the argument with the unnamed man had been over refugees and migrants. She said she had told him that countries had a duty to help those fleeing war and conflict, and that in such cases borders did not exist. He told her she would be raped by the very people she was trying to save. "The main thing that's struck me is that some people are now calling me an 'extremist', that being anti-fascist is somehow 'extremist'," she told the BBC. "That seems to be me the height of absurdity." Saffiyah Khan (left) was snapped smiling at an English Defence League (EDL) protester in the British city of Birmingham in April. This Black Lives Matter protest photo of Ieshia Evans standing up to US police in July 2016 has been hailed as "legendary". In Sweden, activist Tess Asplund was photographed with her fist raised to defy a uniformed march of neo-Nazis in May 2016. Hijab-wearing Zakia Belkhiri took a cheeky selfie with anti-Islam group protesters in Antwerp, Belgium, also in May 2016. A series of images of a woman in a red dress tear-gassed by riot police in Istanbul in 2013 became a potent symbol of the anti-government demonstrations in Turkey. Vladimir Cicmanec, the fellow demonstrator who snapped the image, said he had been inspired by recent viral photos of people standing up to fascism. "I didn't see the argument from the beginning - I was looking in another direction and a friend patted me on the shoulder - but I was just a few metres away from them," said Vladimir, who described himself as a computer programmer and amateur photographer. "I immediately thought of that photo of the girl from Birmingham and said to myself - this could be an interesting image too. So I starting snapping away." Vladimir pointed out the neo-Nazi rally was outnumbered about two-to-one by anti-fascist demonstrators. Lucie, meanwhile, said she was not concerned about her physical safety. "Even if something had happened to me, physical wounds always heal in the end," she told the BBC. "But if I'd kept silent or if I'd decided not to get involved, it would have left a wound inside me that would never have healed."